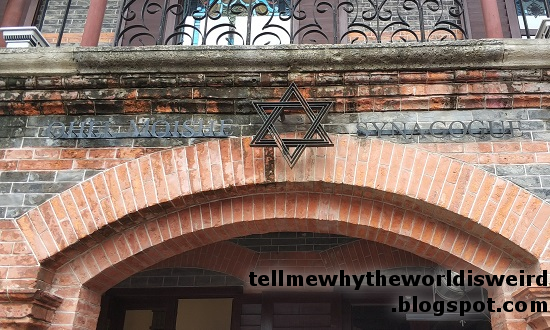 Sign that says "上海犹太难民纪念馆 Shanghai Jewish Refugees Museum". During World War II, about 20,000 Jewish refugees came from Europe to Shanghai to escape the Holocaust. 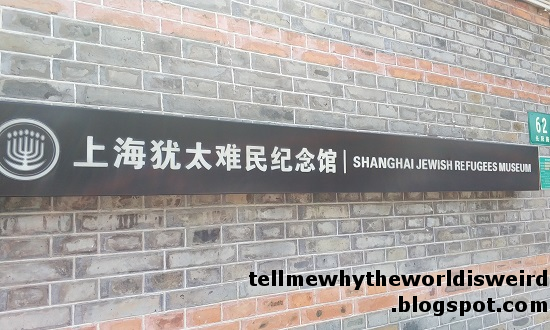 There is a museum called the Shanghai Jewish Refugees Museum, which commemorates this. Here are some of my photos from when I went there. 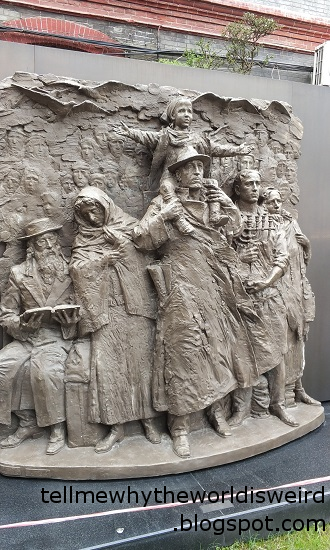 Statue of a Jewish refugee family. Wall plaque with text in both English and Chinese. 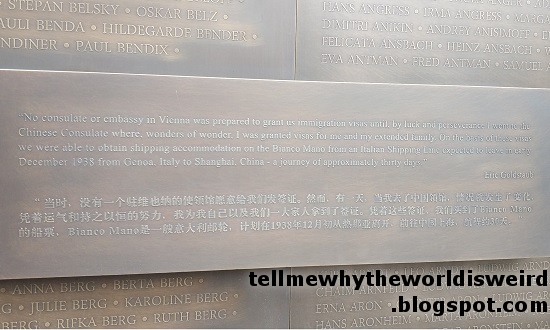 The English text says, "'No consulate or embassy in Vienna was prepared to grant us immigration visas until, by luck and by perseverance I went to the Chinese Consulate where, wonders of wonder, I was granted visas for me and my extended family. On the basis of these visas we were able to obtain shipping accomodation on the Bianco Mano from an Italian Shipping Line expected to leave in early December 1938 from Genoa, Italy to Shanghai, China - a journey of approximately thirty days.' 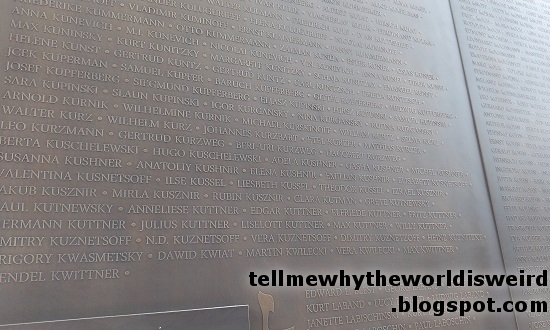 Eric Goldstaub"
This wall has the names of about 13,000 of the refugees who came to Shanghai. Plaque with text in English, Chinese, and a third language (German maybe?). 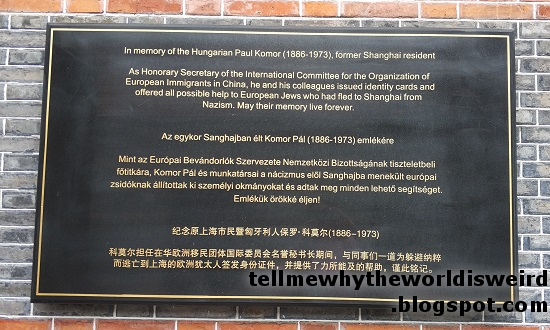 English text says, "In memory of the Hungarian Paul Komor (1886-1973), former Shanghai resident. As Honorary Secretary of the International Committee for the Organization of European Immigrants in China, he and his colleagues issued identity cards and offered all possible help to European Jews who had fled to Shanghai from Nazism. May their memory live forever." Plaque with text in English, Chinese, and Hebrew. 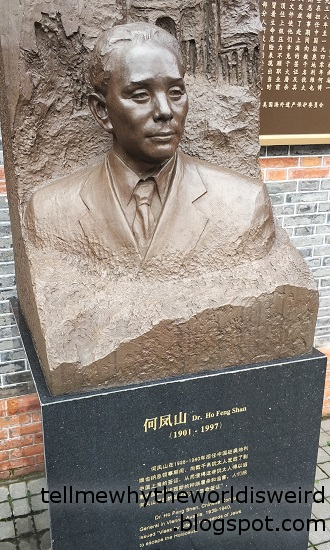 English text says, "Ho Feng Shan 1901-1997 Born in Henan Province, he became a diplomat in the service of China. Between 1938 and 1940, while Consul General in Vienna, Austria, Dr. Ho rescued thousands of Jews from the Holocaust by issuing visas to Shanghai and other documents. Ignoring the orders of his superiors and at risk to his career and personal safety, he acted with steadfast courage when most would not. United States Commission for the Preservation of America's Heritage Abroad"
White text on a black background, in Chinese and English. 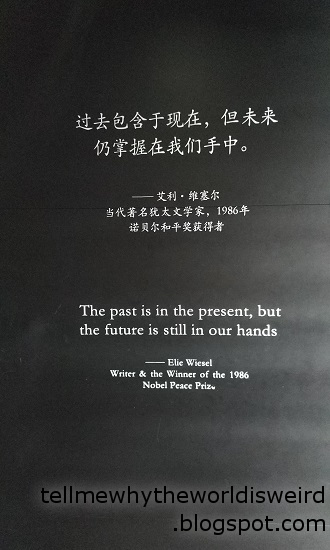 English text says, "The past is in the present, but the future is still in our hands. -- Ellie Wiesel, Writer & the Winner of the 1986 Nobel Peace Prize"
There were exhibits about how they traveled from Europe to Shanghai, and how they lived in Shanghai. 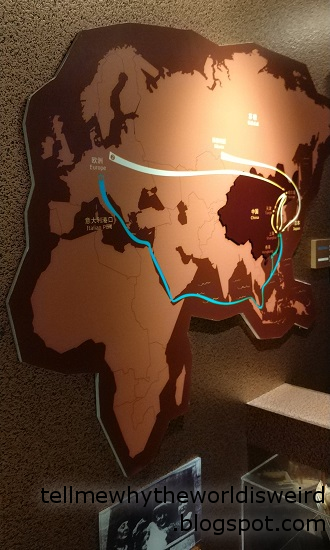 Map that showed routes that the refugees took from Europe to China. Basically some of them took a train through Russia and some took ships down around Egypt. A menorah, with handwritten text in Hebrew (I think?) and English on the wall behind it. 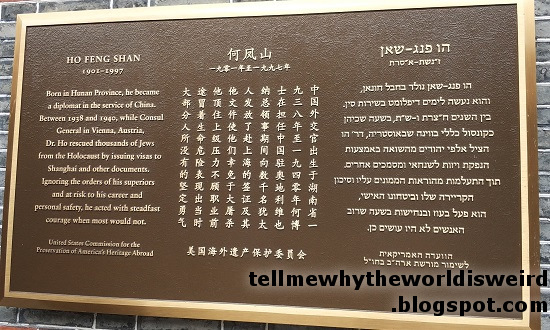 English text says, "To the people of Shanghai for unique humanitarian act of saving thousands of Jews during the Second World War. Thanks in the name of the Government of Israel." A quote from Yitzhak Rabin, Premier of Israel, in 1993. 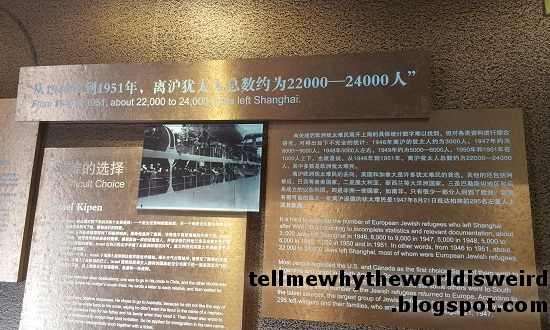 Next, there was an exhibit about what happened to the Jewish refugees during the Japanese occupation of Shanghai. It wasn't good- the Japanese imposed restrictions on them, and they had to live in crowded, impoverished conditions. 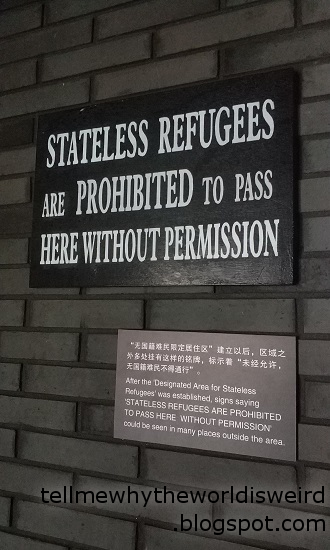 Sign that says "Stateless Refugees are Prohibited to pass Here Without Permission." From when the Japanese occupied Shanghai. Here's the entrance to the Ohel Moishe Synagogue. 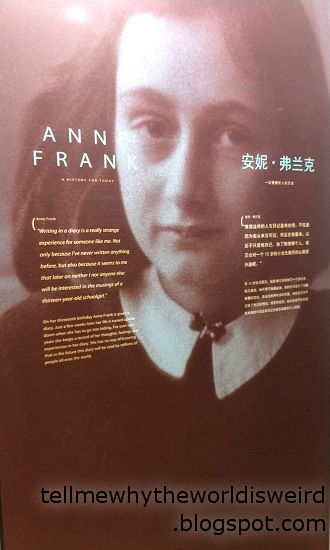 Exhibit which shows a photo of Anne Frank, along with her name in both English and Chinese (安妮 弗兰克). 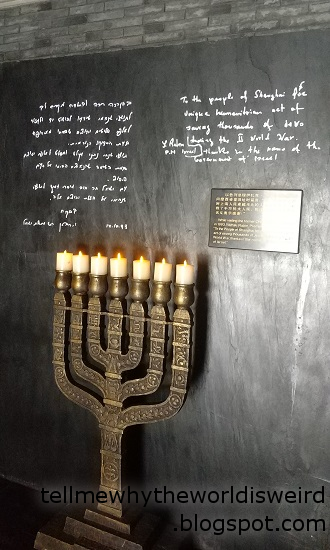 There was also an exhibit about Anne Frank and her family, inside the synagogue. Looking at everything in this museum (especially the Anne Frank exhibit, which described how Germany gradually became more and more horrible to Jews, leading up to the Holocaust), I was really overwhelmed, like "how could this happen?" It's hard to even believe that people could do that to people, but it's real. And there have always been refugees forced to leave their countries because of violence, and we need to help them like Shanghai did during WWII. It's so important that we learn about this history.